We offer many volunteer opportunities. At the House of Peace site, we need help in our food pantry and our clothes closet. Can you organize a holiday food box drive or a hygiene supply drive? Your help makes all the difference in the world to our central city families. 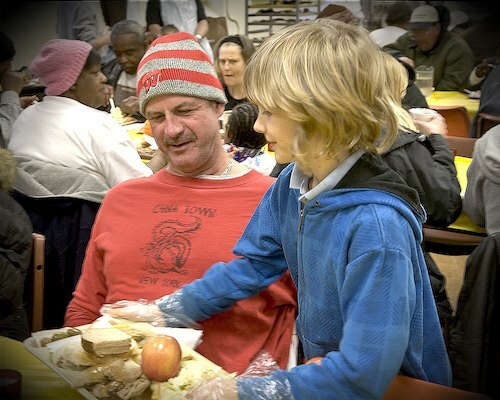 At St. Ben’s Community Meal site, volunteers are needed each night to help with beverages, tables, and dishes. We normally schedule 8-10 volunteers each night for our daily meal service and the minimum age of volunteering is 12 years old. We also encourage volunteers to perform a Ministry of Presence: to sit with our guests, engage them in conversation, meet them on their terms, and share your experiences. That is the greatest gift one person can give to another: to be wholly present, to listen, to be attentive, to show care. To volunteer, please email Trevor Poppe at ccsvol@thecapuchins.org, call 414.271.0135, ext. 2219. Or please fill out the form below to tell us how to get in touch with you. What are your volunteering interests?